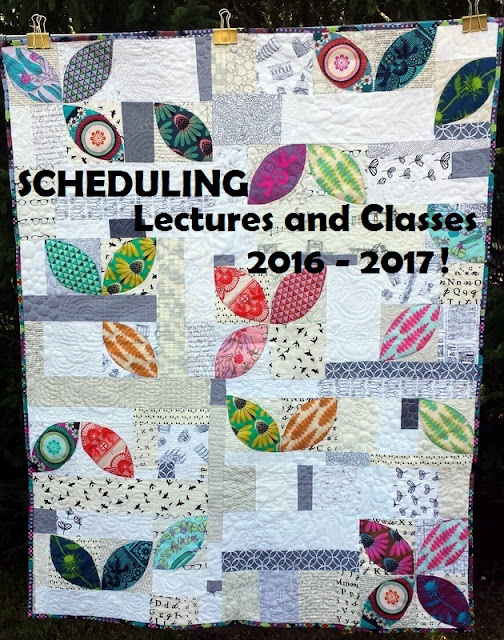 Quilty Habit: I'm Available for Lecturing and Teaching in 2016-2017! I'm Available for Lecturing and Teaching in 2016-2017! One of my favorite parts of quilting is having the opportunity to share it with others, whether that be through lectures or teaching classes. If you're looking for a lecturer or instructor for your guild (either modern or traditional!) or quilting event, I'm your gal! I live in western New Jersey, but I'm willing to travel further than the NJ/NY/PA/DE area. My specialties are improvisational piecing and free motion quilting on a home machine. I also give (enthusiastic) lectures about modern quilting and modern traditionalism. See my Classes and Lectures page for more info. I'm currently teaching three classes: Orange Peels and Improv, Gentle Improv Curves Technique + Pillow, and Wonky Cross Technique + Wall-hanging. I can teach others based on request - again, see more here. You can view my current schedule on the C and L page as well. Please email me for inquiries, scheduling, and fees at quiltyhabit [at] gmail [dot] com. I look forward to working with you! This week, I'll be back for a WIP Wednesday post, and the second issue of The Wonky Press comes out on Thursday! You can sign up on the right sidebar if you haven't already subscribed and want to check it out. :) Plus, tomorrow is our monthly CJMQG meeting. Yay to a week full of quilts!